Charleston, SC – December 5, 2016 – Technology nonprofit Creative Chatter Communities is launching the Face of Giving campaign as a follow up to last year’s highly publicized Ultimate Selfie Campaign. 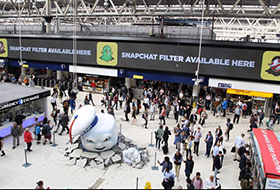 Creative Chatter Communities has partnered with Camera360, one of the world’s leading camera apps with more than 600 million users, and numerous global leaders in digital out-of-home media, such as Lamar Advertising Company, Adams Outdoor, Canadian Digital Network and JCDecaux, to share selfies on digital billboards on an international level. Anyone can participate in the campaign by going to faceofgiving.org and uploading their selfie for a $5.99 donation. The selfies will start playing on digital billboards across the U.S. beginning December 5, 2016. As the campaign progresses, each selfie will also be displayed on digital billboards in countries around the world, including Canada, Europe, and the Philippines, with more to be added as the campaign grows. 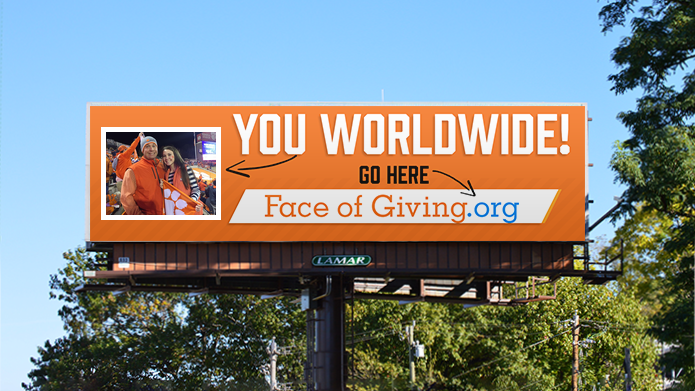 Selfies submitted for the Face of Giving campaign will be displayed on Lamar’s digital billboards in the top 25 markets across the U.S. In addition to showcasing the user-generated content on digital billboards, the campaign will be marketed to users through push notifications and ads on the Camera360 app. Once the selfie is submitted, people can share an automatically generated preview of their selfie playing on a digital billboard and share on social media using the hashtags #faceofgiving and #helpie. “Camera360 is committed to providing our users with amazing and unique ways to use their pictures. Once we heard about this campaign, we immediately recognized it as a worthy cause and a fun concept for our users,” said Emma Yan, Global Marketing Director, Camera360. “The unique aspect of this campaign is the leveraging of digital technology from the outdoor industry, the mobile app community and the nonprofit sector to help people in need,” said Clay Braswell, CEO of Creative Chatter Communities. “This is a great example of collaboration and showcases the way technology can make a difference in our local communities and around the world.” Each selfie submission makes it possible to meet a need. Creative Chatter Communities, a 501 (c)3 nonprofit, connects nonprofit organizations with in-kind donations from the public and business community. Our platform matches items in real time to simply the in-kind donation process. When nonprofit organizations spend less time looking for in-kind donations, they can invest more time with people, helping them find and implement true solutions. That’s the heart of Creative Chatter Communities. Founded in 1902, Lamar Advertising (Nasdaq: LAMR) is one of the largest outdoor advertising companies in North America, with more than 325,000 displays across the United States, Canada and Puerto Rico. Lamar offers advertisers a variety of billboard, interstate logo and transit advertising formats, helping both local businesses and national brands reach broad audiences every day. In addition to its more traditional out-of-home inventory, Lamar is proud to offer its customers the largest network of digital billboards in the United States with over 2,500 displays. Please feel free to explore our website www.lamar.com or contact us for additional information.